Webinars are consistently ranked among the top-performing marketing tactics to boost engagement and demand. 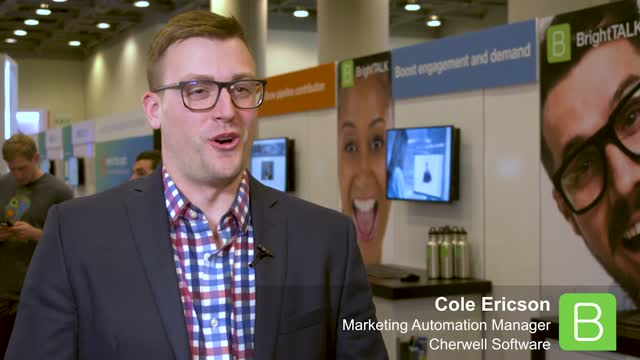 Learn how and why Cherwell uses BrightTALK's AI-powered content and demand marketing platform. Cherwell uses BrightTALK Channels to give inspiring Talks and grow its audience. BrightTALK Content Leads and BrightTALK Community Summits are among their highest performing demand programs. Watch this short video to learn how content marketing is evolving. Learn insider tricks on storytelling from world-renowned storyteller, entertaining speaker and a prolific author Carla Johnson. Over the last two decades, Carla has helped architects and actuaries, executives and volunteers, innovators and visionaries leverage the art of storytelling to inspire action through amazing experiences. Her work with Fortune 500 brands set the stage for the latest of her seven books. Experiences: The 7th Era of Marketing sets the benchmark for a powerful new way for marketing to create value for businesses. Named one of the top 50 women in marketing and the chair of the ANA’s Business Marketing Association board of directors, Carla regularly challenges conventional thinking. Watch this short video to learn more about BrightTALK. This Channel features content that will help you learn and grow with BrightTALK.